Home /Can You Dig It? Lesson 1: Don’t wear a white shirt to an archeology dig. It will be brown by the end of the day. Lesson 2: Close your mouth (or better yet, step aside) when a shovelful of dirt flies in your direction. Lesson 3: Wherever you stand on this earth, there could be truly intriguing fragments of past lives lodged in layers of soil beneath your feet. It’s a warm day in July, and I’ve joined a Field School dig at the site of the Native American village known as Joara, which was established as early as the 1400s. Just outside Morganton, this stretch of land owned by the Berry family (it’s also know as the Berry Site) is where two cultures collided: natives living in their established hub and Spaniards led by Juan Pardo. From an outpost on Parris Island, South Carolina—then called Santa Elena—he journeyed here to build Fort San Juan, the first inland European settlement on the continent. What lies beneath today is slowly divulging clues about a murky period in North American history, when the first face-to-face interactions between the Old and New Worlds took place. The day starts under a white-top tent with a briefing on what was unearthed the day before and where the digging will take place today. 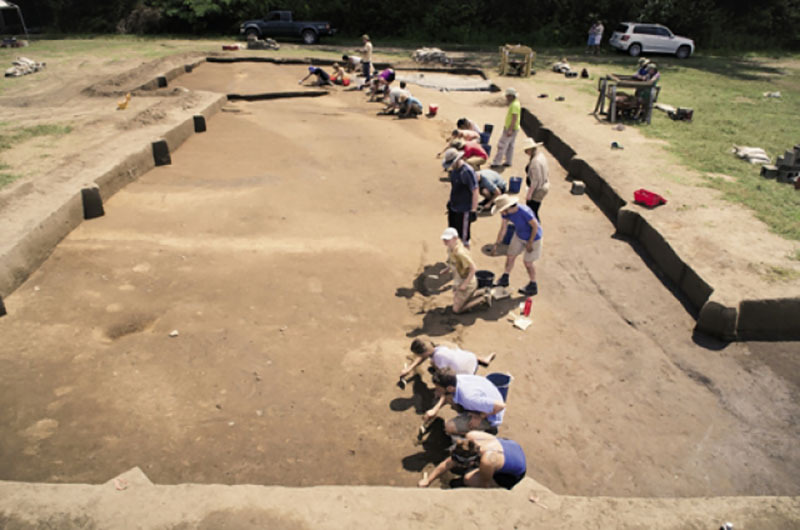 Earlier in the week, the fresh group—a blend of college students and people simply fascinated by the site or archeology—went through orientation before taking on simple tasks, such as digging and sifting. Some of us are assigned to break ground on small plots of earth several yards from the largest exposed section of the site, where archeologists and project managers David Moore of Warren Wilson College, Rob Beck of the University of Michigan, and Chris Rodning of Tulane University have identified the ditch that surrounded Pardo’s fort. That’s where the experienced students will spend the day. The fact that anyone can join in this discovery process is a rare model. “These days in archeology, public involvement is more common, but the level to which we carry it is very uncommon,” says Moore. “We’ve always designed our project to engage the public at every level we can.” Each summer, the Field School welcomes students and others for four weeklong sessions of working side by side with archeologists. Primary schools bring students out for the experience in minicamps too. In my group, a Greensboro couple has come for an educational vacation. There’s even an annual Berry Site Field Day for the public, and Burke County residents flock to see the progress. Moore directs us to our patches of ground with a rousing hunch: “I know there is something exciting out there,” he predicts. “There is going to be a Spanish artifact out there today.” We all want to be the person who finds it. We take turns digging and sifting earth. Digging involves putting the edge of a shovel into the ground at a 45-degree angle, skimming off the top layer of earth, and tossing it into a three-by-three-foot framed screen that’s set off the ground with sawhorses. Those on sifting duty stand on the opposite side of the screen waiting for the dirt to land before running their hands over it, separating soil from pieces of history. As you move the dirt back and forth over the mesh, the loose soil falls into a wheelbarrow below. What looks like a lowly clod can reveal an arrowhead, sherd, or animal bone from a long-ago meal. If you’re extra lucky, you might find a ball of Spanish lead shot. Or the clod could be just what it seems, a lump of dirt that bursts apart in your hands. One student seems to have arrowhead radar, finding several just this week. Unearthed objects are carefully bagged and tagged with the date and location found. Uncovering a piece of black, perhaps charred, earthenware inscribed with decorative lines is my first taste of discovery. The sherd leaves me wondering about the story behind it. And where is the rest of the pot? It’s unlikely it will ever be whole again, as this field didn’t sit fallow; it was plowed by farmers for two centuries. At one time, there was even an Indian mound here, but sadly it was leveled around the 1930s or ’40s. Still, when all these little pieces are collected, cataloged, and examined, they’ll help detail this cloudy time in history. What is known, through records from Santa Elena, is that the Spaniards finally wore out their welcome in Joara. From the moment they arrived, they considered the native people subjects of their king. They stayed 18 months, from 1567 to 1568, before the situation came to a head. The natives burned the fort and killed most of the Spaniards while Pardo was away. One soldier was left alive to flee back to the coast and tell the tale of the slaughter as a warning. It was a powerful message, and the Spaniards heeded it, losing their early foothold on settling the continent. Had they stayed, North American history would have unfolded quite differently. At our lunch break, we sit in a circle under a tent and talk about finds and the plan for the rest of the day—more digging before we head back to the Wall Center for Archeological Research in downtown Morganton to wash some of the found objects. What settles in as we take a breather is that this job requires an incredible amount of patience. Any discovery could lead to a new theory. Finding the site near Morganton was itself a shift in theory since it was once believed to be near the Qualla Boundary, much farther to the west. The afternoon presents just such an opportunity for interpretation when an excited shout from Beck interrupts the digging. He’s found a charred post set vertically into the ground that he thinks is a relic of Fort San Juan. This find could take the story in many directions and reveal more about how the fort was constructed. We all gather around to gawk: Moore’s prediction was right; there was a Spanish artifact out there, just a bigger one than we anticipated. Field Day: The public is invited to visit the Berry Site from 10 a.m. to 2 p.m. on Saturday, June 20. At this free family friendly event, visitors can learn about the summer Field School’s progress, take in a flintknapping and pottery demonstration, and view Native American artifacts. For more info, www.visit exploringjoara.org.